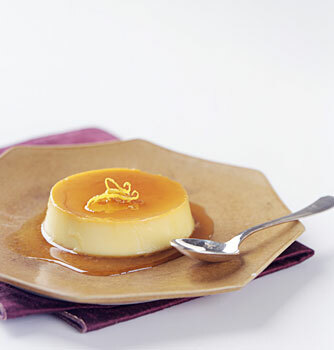 Creme Caramel is like Creme Brulee's homely first cousin. It's also delicious, but not as dashing and debonair as C.B. - it lacks the richness and decadence that comes with full cream, but it makes up in lightness and airiness. This particular recipe is full of flavour, however it uses low-fat milk, so it's hips friendly. I used to make this one a lot, it's even easier than Creme Brulee, and you don't have to wield a kitchen torch in order to make one. Recipe is from my ancient (1998!!!) issue of Bon Appetit. Combine milk and cinnamon stick in medium saucepan. Bring to simmer. Remove from heat. Cover; let stand 30 minutes. Discard cinnamon stick. Preheat oven to 350°F. Divide orange strips among four 3/4-cup custard cups or soufflé dishes. Stir 1/2 cup sugar and 1/4 cup water in heavy small saucepan over low heat until sugar dissolves. Increase heat and boil without stirring until syrup turns deep amber, occasionally brushing down sides of pan with wet pastry brush and swirling pan, about 8 minutes. Immediately pour caramel into custard cups, dividing equally. Whisk egg, egg white, vanilla and remaining 1/3 cup sugar in medium bowl to blend. Gradually whisk in milk mixture. Pour over caramel in custard cups. Place custard cups in roasting pan. Pour enough hot water into pan to come halfway up sides of cups. Bake until custards are set, about 1 hour 5 minutes. Remove from water. Chill overnight. Run small knife around custards to loosen. Invert custards onto plates. Now, if this is too ninny of a dessert for you, you can increase it's fat factor (pray for your hips! )by using full fat milk and 2 eggs instead. But i think it's perfect the way it is!